It's been an incredibly busy weekend online - by far the busiest yet - so today is going to be a day of packing, packing, packing. I've left a plea for help on my mum's answerphone and am hoping she will come to help - otherwise it's just me and Humphrey and a whole load of boxes... yikes. 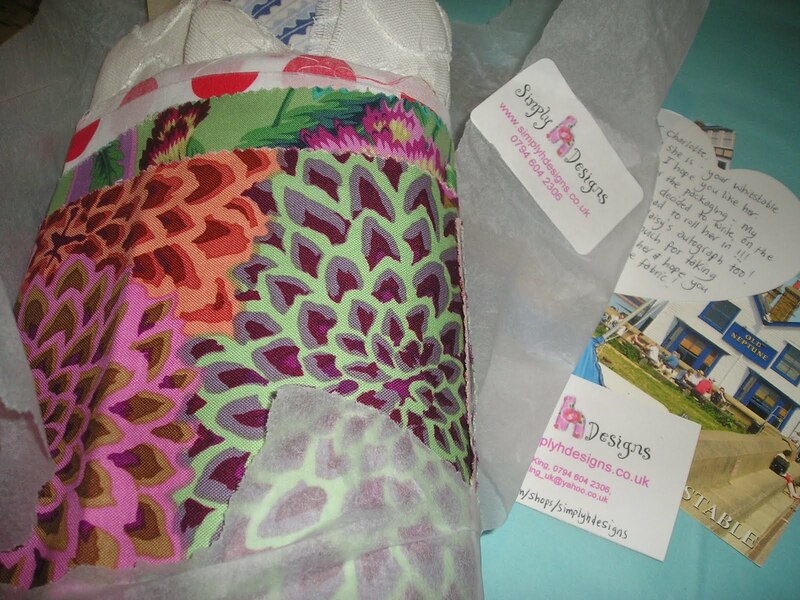 In the midst of the chaos at the end of last week, something very exciting happened - I received a lovely parcel through the post. 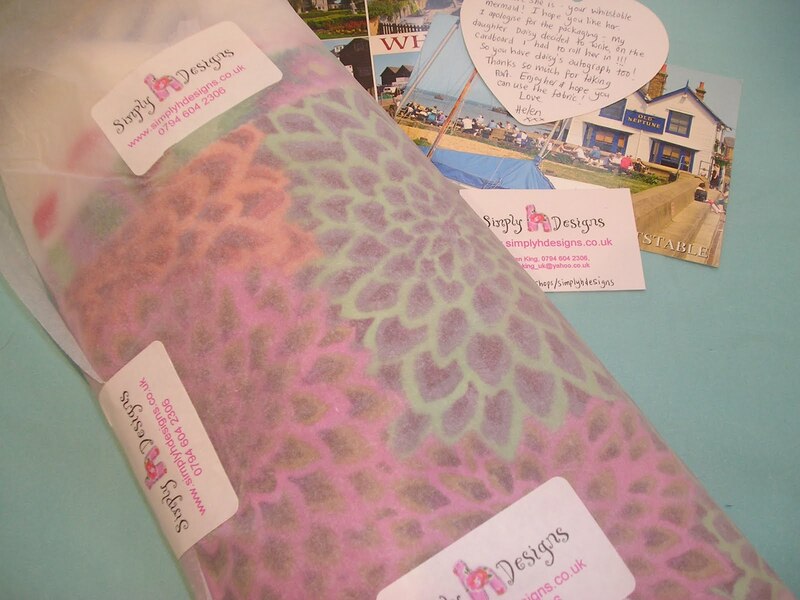 No, not another order to be unpacked and inventoried, but something really special - a delightful present from Helen at Simply H Designs. I am such a lucky girl and had won her giveaway last weekend - thank you, thank you, thank you! 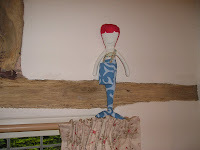 - and this meant that I am now the proud guardian of one of her lovely fabric mermaids! I am so chuffed I cannot tell you, I know everyone always says this but I never win anything and as Helen will tell you, the news of my win arrived at just the right moment - in the middle of a bit of a horrible time last weekend - and truly lifted my spirits. She came with her own little note, telling me how to best care for her, postcards of her home in Whitstable, and in her little bag is a collection of pretty shells. Isn't she just beautiful? First I tried her in the bathroom (figured she'd be happy in there, all that water) and sat her on the top of the curtains. 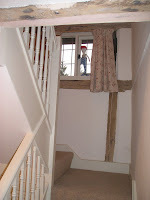 But finally decided she would reside on the landing - she is so pretty to look at as I am walking upstairs. she's lovely and I'm glad to hear she lifted your spirits. ...and she is so adorable - well done and congratulations. I LOVE that mermaid!!!! How incredibly cute! Congratulations! THANK YOU so much for the comment you left on my blog. I am sorry you have felt that way too. Your words were spot on! Sending you big hugs and wishes for a happy holiday season! 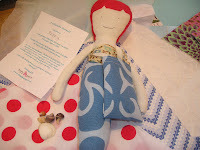 Ps You don't have to make anything with the fabric if you don't want to! No pressure, honest! Mum did come and help - thank goodness, for Humphrey was no use at all! 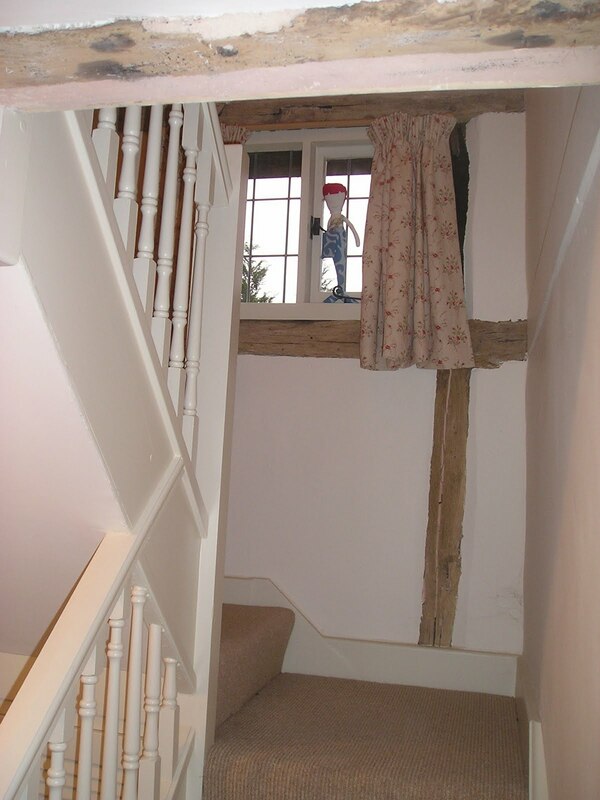 Ooh Charlotte, loving those beams on your landing! 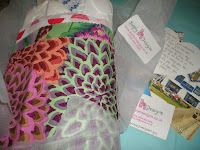 How lovely that you won the meramid, hooray and such gorgeous wrapping too! Of course you loved the Secret Garden, it goes without saying! Glad the business is busy too!